Last month, I became a grandfather. My son and his wife gave birth to twins. A boy and a girl. There’s an interesting story behind this. 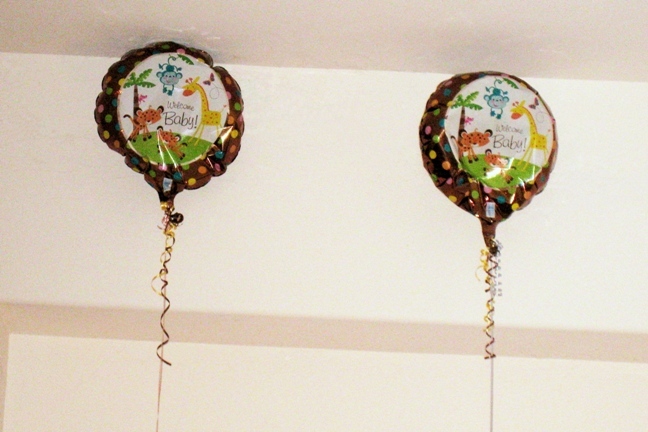 About four months ago, a bundle of balloons were bought to our house for a baby shower. As you might expect, most of the balloons lost their lift in a few days. However, two of the balloons kept floating. They were made of Mylar, so the helium leaked out much slower. How long they could they last? We kept them around to see. After a month, I had the crazy thought that they might last long enough to see the birth of the babies. That would mean staying afloat for about three months, which seemed unlikely. Then, about two weeks later, I was looking at the balloons with Stephanie, my daughter-in-law, when the inner image hit me: I saw the balloons dropping down off the ceiling when the babies were born! Could something like that happen? So, after that, everyone was watching the balloons. We would check them regularly. They became a symbol for how the babies were doing. Levan, my son, named them the Oracle Balloons. The balloons didn’t budge until February 2. Then, we saw the balloon with the blue streamer come down off the ceiling, briefly, for a few seconds, before bouncing back up. See photo on the left. Let me explain about the streamers: By the time of the baby shower, we knew there would be twins, a boy and a girl. Most of the family had guessed this even before the doctors confirmed it. Karen, my wife, had a dream where she saw a boy and a girl being born. Stephanie just knew it, inwardly, and a number of us had seen the boy earlier during a Soul Travel exercise. So, for the baby shower, one of the Mylar balloons was made with a pink streamer, and the other with blue. The babies’ names were also chosen by early January. The boy’s name is Everett, and the girl is Lena. Stephanie began guessing, in early Jan, on which day they would be born and how much they would weigh. She tried to get her friends and family to guess. Most everyone had guessed birth dates before the end of Jan, since that was near the due date. In other words, by Feb. 2, the balloons were already more accurate than most of the guesses. On Feb 2, we found the blue balloon had somehow dropped down over night to a lower level. 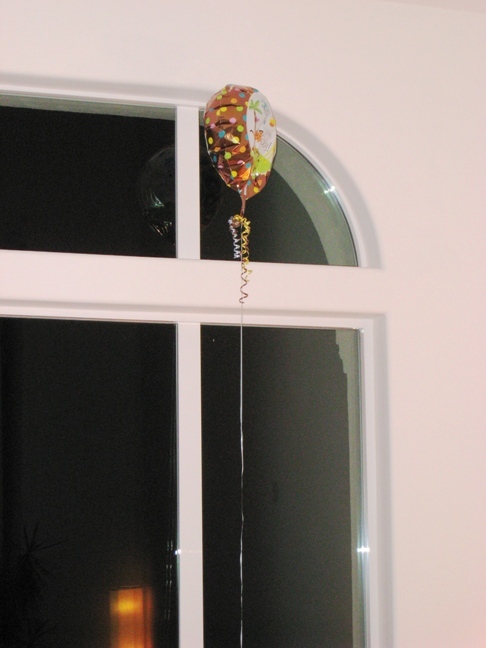 But the pink balloon was still firmly on the ceilin g.
The next day, we woke up and couldn’t find Everett’s balloon anywhere, until we found that he had wandered into the “living room” and was looking out the window. See the photo on the right. Everett was clearly ready. But Lena’s balloon was still sticking to the ceiling. She was happy in the warm oven, and wasn’t ready to leave. Nothing changed until Feb 6, when Everett’s water broke, around 10 pm. Before we left for the hospital, I noticed that Lena’s balloon was briefly coming down from the ceiling for the first time. What we didn’t realize was that when the babies’ water broke, it was only Everett’s birth sac. 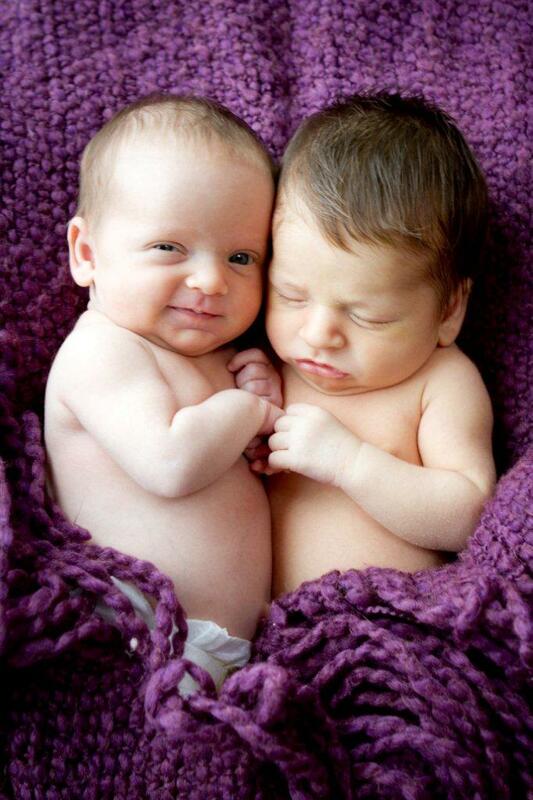 When fraternal twins are born, they are almost always in two separate sacs. We found out afterthe birth that the babies were in two separate sacs, but their sacs were joined by a common side. It was like a single sac with a divider, keeping the babies separate, yet connected. The nurse told us that this was rare, but was the best option for twins. Everett was born first. The doctors broke Lena’s water a minute or two before she was born. They were born around 11 am on Feb 7, within 11 minutes of each other. So, when we got back home, after the birth, I wrapped the two streamers from the balloons around each other, since the babies had been separate, but attached. When connected like this, both balloons were all the way down to eye level, in the living room, with their tails dragging on the ground. Photo on left. That’s the story of the oracle balloons. They were never changed in any way. Everything happened naturally, including the births. It still amazes us that the balloons would remain on the ceiling for 3 months, and would both come down around the time of birth. Everett’s came down first, as if he was ready, waiting on Lena, who needed more time. But they were connected, so Everett had to wait. The birth went full term, which is not usual for twins. The balloons were more accurate than anyone’s guess, and gave us a perfect depiction of what was happening. It was like an insider’s view. You couldn’t ask more from an oracle. Things like this happen all the time, around us. We often miss the subtle messages. Who would think to watch balloons? We are fortunate when we catch a glimpse of the way life speaks.